Think the updates are enough to make the Endeavour facelift good competition for the likes of the Fortuner and Alturas G4? Yes, the newly launched 2019 Endeavour is the an awesome luxury SUV and retains the crown. It is so charming that it attracts the Indian buyers more and more and has an ultimate road presence. I am soon buying one and this article also helps me make my decision sooner: Bold and Tough new Endeavour 2019. 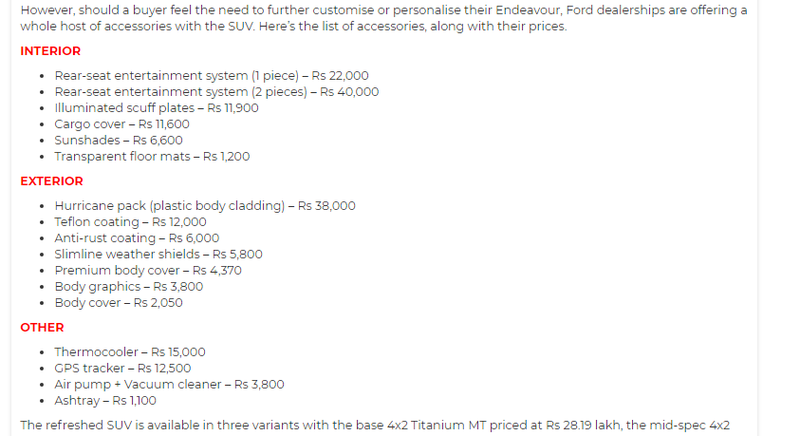 Here's a list of some of the accessories available for the Endeavour.